Top-quality milk: what it takes Here's a detailed look at the practices of the five Platinum winners in the National Dairy Quality Awards competition. Meticulous milking is vital, but it takes concerted effort in all areas of herd care to produce the best milk in the nation. It's a pleasure for us to recognize the Platinum winners in the 2011 National Dairy Quality Awards program and share how they produce such high-quality milk. These five farms stand out as having exceptional milk quality records, along with well-defined plans for providing healthy, comfortable environments for milking herds and dry cows. Here, you will find details of how these special herds approach the daily tasks of milking and caring for their cows, as well as their strategies for preventing new infections during the dry period, monitoring fresh cows, and treating clinical cases. Most of what they do does not involve expensive facilities, new technology, or extraordinary efforts. 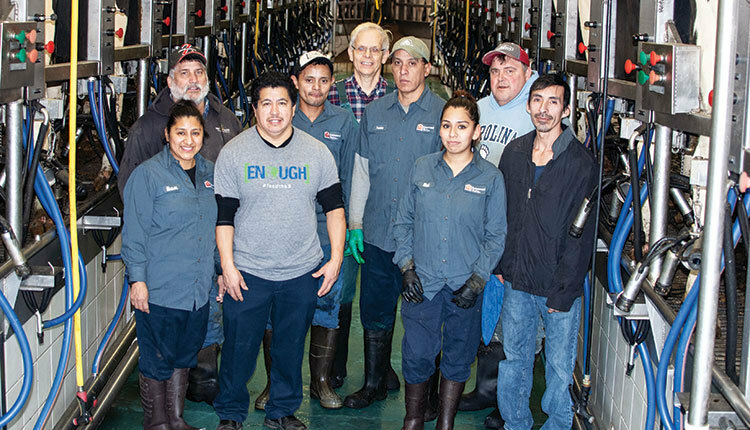 They just make sure that the milk-quality basics in the parlor and in the barn are covered all day, every day by family members and employees alike. Nominators submitted screening applications for nearly 200 farms. Of those, 60 farms merited careful analysis by a panel of judges. The nominations then were designated as Platinum, Gold, or Silver. See the previous page for a list of all winners. You also will see their nominators who deserve thanks for their participation. Hoard's Dairyman is honored to co-sponsor the National Dairy Quality Awards with National Mastitis Council. The program would not be possible without the sponsorship of GEA Farm Technologies, IBA/Ecolab, Elanco, QMI, Select Sires, and the major sponsor Merial. The Brooks family milks 238 Holsteins near Waupaca, Wis. Shown from left are: Tom Kilty, Ron Brooks, Jesse Thoma, Josh Claussen, Corky Newman, and Dodge Brooks. A combination of three employees and one family member handles milking chores in the farm's double-6 herringbone. They predip and then strip, always wearing gloves. Only 3 percent of their cows had clinical mastitis cases between June 2010 and May 2011. The milking herd and dry cows are housed in sand-bedded free stalls. The maternity area is bedded with straw. 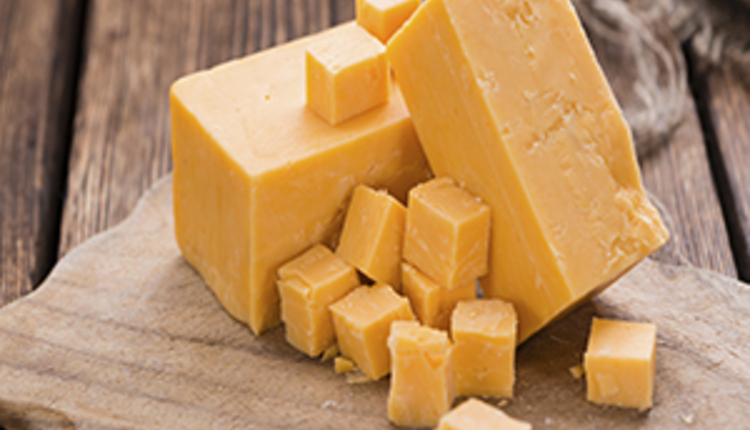 "This dairy has not had a (monthly) SCC over 100,000 in four years," said nominator Lynn Thornton with Grande Cheese Company. 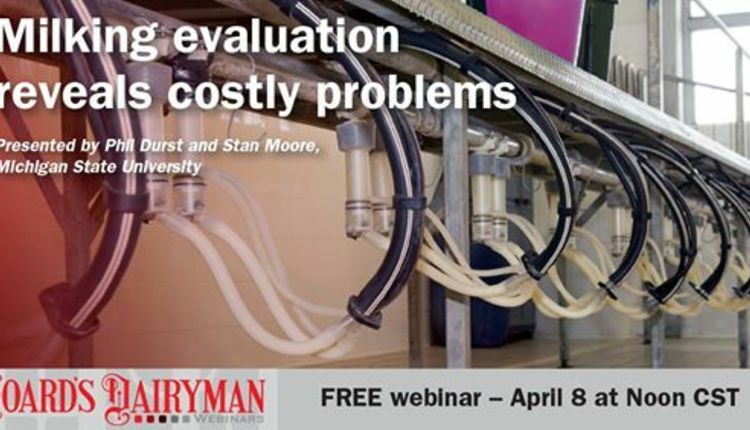 "It consistently produces high-quality milk without using some of what are considered best management practices such as culturing and using teat sealants." The Dellars, Harrisville, Mich., combine 27,000 pound-per-cow production in their 230-cow herd with an impressive 53,000 SCC. Ryan and Charina are pictured with children Carmen and Gavin. Employees do most of the milking, following a written protocol. The herd is milked in a double-10 parallel and housed in sand-bedded free stalls. The Dellars culture all clinical cases but have not felt the need for bulk tank culturing. To control E. coli mastitis, their most persistent problem, they have changed their vaccination program and stepped up stall maintenance. 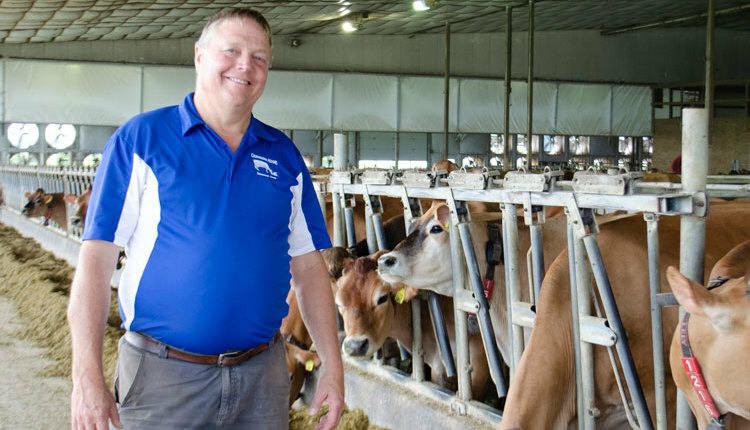 According to nominator Preston Cole with Michigan Milk Producers Association, the Dellars "enjoy paying close attention to even the finest details while constantly researching and implementing innovative ideas, and they inspire their employees." Udder health-related culls made up just 3.5 percent of cows leaving the Kleinhans' herd. They have a 141-cow Holstein herd at Kiel, Wis. They milk in a flat-barn parlor and keep their cows on sand-bedded free stalls. They were nominated by Roger Hallberg with Land O'Lakes. Dry-off at the farm involves dry treating all quarters, using a teat sealant, and vaccinating for E. coli and Salmonella. They also vaccinate heifers before they freshen for the first time. Mild and moderate clinical cases are handled by giving oxytocin and Spectramast L C or Pirsue. 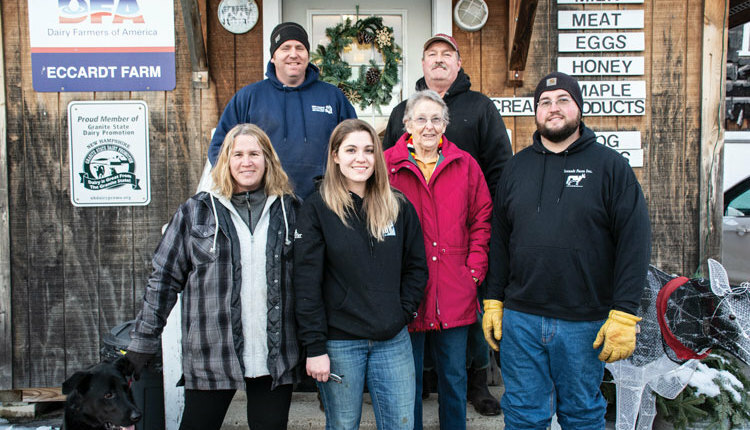 Pictured from left in back are: part-time milkers Tania Grouman, Carri Lisowe, Tore Loritz, Judy Schema, and Gerry Ditter. In front are Ryan, Alex, Nancy, and Mike Kleinhans. Five-time Platinum Award winners, Dean and Patti Tohl milk 90 Holsteins and Jerseys near Tillamook, Ore. They again were nominated by Bryan Gibson, with Tillamook County Creamery Association, who said, "The record of high-quality milk produced by this couple year after year may never be matched." The Tohls had a SCC average of 44,000 with no month over 53,000. Only 10 percent of their cows left the herd during the year, and there were no udder health-related culls. 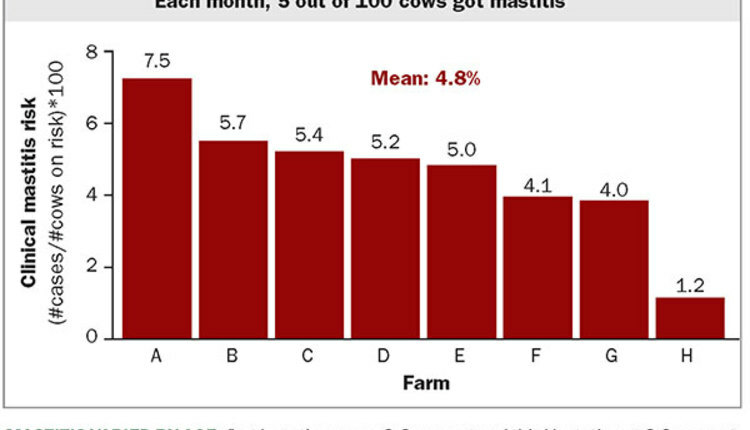 Only 3 percent of their cows had a clinical mastitis case. The herd is housed in free stalls with kiln-dried shavings as bedding. Patti and Dean do all of the milking in the herringbone parlor. Cows are pastured about seven months of the year. The VanPolen team members are repeat Platinum winners. Shown in front (from left) are Beth and Laurie VanPolen, Kristin Hamacher, and Mike VanPolen. The back row includes Rick, Duane, and Ken VanPolen, and Alex Hamacher. The VanPolens milk 215 Holsteins near Marion, Mich. Their herd is housed in sand-bedded free stalls and milked in a double-5 herringbone. In addition to having a low SCC, 72,000, the farm had an average standard plate count for the year of 1,000. Katie Pierson with Michigan Milk Producers Association nominated them. She credits the VanPolen team with patience and extremely close attention to every detail involved in managing their herd. Brooks: We do have a written milking procedure, and milkers always wear gloves. We predip, strip out foremilk, dry teats with microfiber towels, attach milking units, and postdip. 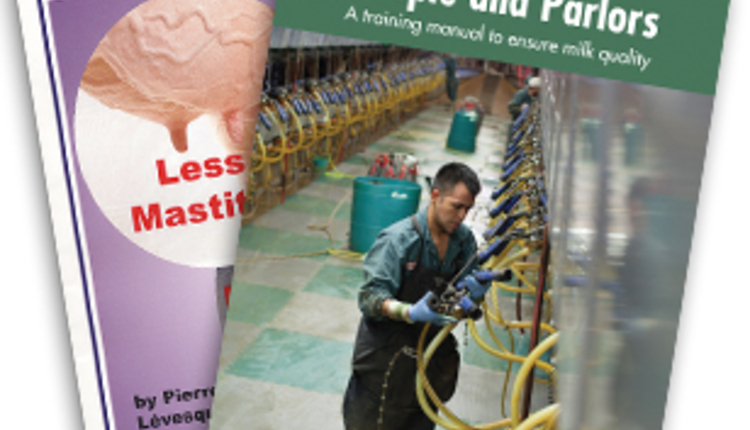 Dellar: There is a written milking procedure.Milkers wear a clean pair of gloves for every milking. We predip, strip out foremilk and massage dip into teat ends, dry teats with microfiber towels, attach milking units, and postdip. Massaging the dip into the teat end is a key step in our procedure. Kleinhans: We also have a written milking procedure, and milkers always wear gloves. We strip out foremilk, predip, dry teats with micro cloth towels, attach milking units, and postdip. Tohl: We abide by a written milking procedure, and milkers always wear gloves. We dry wipe teats, strip out foremilk, dip, scrub teats, dip again, dry teats with paper towels, attach milking units, and postdip. VanPolen: Milkers follow a written milking procedure, and they wear a clean pair of gloves for every milking. We wipe sand and debris from teats and udder with a dry cloth towel, strip out foremilk, predip, dry teats with cloth towels, attach milking units, handstrip after milking, and postdip. How do you maintain healthy teat ends? Brooks: We credit equipment maintenance, using microfiber towels, changing to Gold Bloc winter dip November through March, and flushing our variable speed vacuum pump biweekly. Dellar: We attach units in a timely manner so the milker is on the cow as little as possible, so she doesn't get overmilked which minimizes hyperkeratosis. We try to utilize the full oxytocin letdown of the cow. Kleinhans: We keep cows' udders clean as possible and maintain vacuum levels. Tohl: We maintain equipment, check vacuum level at every milking, change inflations regularly, attach machines at letdown, don't overmilk, and limit liner slips. VanPolen: We make sure free stalls are clean and dry. We make sure teats are clean and dry and that a barrier postdip high in emollients is applied after milkout. We use Lauren liners in our milk claws which have less slippage, and we don't overmilk the cows. What do you do to keep cows clean and comfortable? Brooks: All cows are on sand-bedded free stalls, prefresh group has oversized free stalls (greater than 54 inches), and the maternity area is bedded with straw. Free stalls are scraped twice a day on lactating and once a day on dry cows/heifers. Backs of stalls are hand cleaned when scraping alleys. There are no brisket boards. We just pile sand in front. Dellar: Alleys are scraped three times daily along with the backs of the stalls being raked out. The entire stalls are raked every day and new sand is put in one to two times a week, depending on need. Waterers are emptied and cleaned daily, as well. Kleinhans: Sand-bedded stalls are cleaned daily and bedded every two weeks. Barn alleys are scraped twice a day. We have tunnel ventilation. Tohl: Cows are all housed in free stalls. Kiln-dried shavings are used for bedding, and stalls are cleaned and alleys scraped twice daily. New bedding is added as needed. There are more stalls than cows. Fresh water is always available. Bunk space is available for all cows. Cows are also pastured about seven months out of the year. VanPolen: Manure is removed from free stalls at least twice a day. Alleys are scraped twice a day. Stalls are bedded with sand and are refilled every 8 to 10 days. Free stall barn has curtain sides which are adjusted according to the weather. The ceiling is high and insulated. There are large doors across the front and back of the barn which can be opened to allow good airflow. How do you detect subclinical cases? Brooks: DHIA testing on test day. Dellar: DHIA hot sheet, CMT paddle, and PortaCheck. VanPolen: Udder inflammation, lack of milkout, elevated SCC. How do you detect clinical mastitis? Dellar: Prestripping, udder appearance, and cow appearance. Kleinhans: Visual, CMT, and DHIA SCC. Tohl: Milk observations, cow behavior, udder "feel," and CMT. VanPolen: Elevated SCC, flakes when prestripping, swollen quarters. Brooks: All quarters are CMT paddled at freshening. Fewer than 1 percent of quarters show positive. CMT is done at first milking, and, if positive, the cow is treated with oxytocin and Cefa-Lac. Milkers and barn people are trained to watch the fresh cows closely. Dellar: CMT paddle and PortaCheck are used on every fresh cow/heifer. Also, we use the DHIA hot sheet. Cows are paddled and PortaChecked at three days fresh. If necessary, a culture is performed on high quarters. Cows are then monitored on monthly DHIA sheets. Kleinhans: Visual checks and J-5 two weeks before calving. We visually check quarters and milk, strip out Orbeseal, and pay close attention to body temperature. Tohl: CMTs are taken on all fresh cows at calving and several times before being milked in the line. Fresh cow CMTs are compared to dry up CMTs. We screen test day SCCs and take monthly CMTs on all cows over 200,000. If cows are over 200,000 SCC and CMTs show a 2+, a milk culture is done. VanPolen: We forestrip all cows with extra attention given to fresh cows. We watch for any udder swelling and lack of milkout. All fresh cows are milked in a bucket for six milkings after freshening. Claws are rinsed well after milkout. Brooks: Tomorrow for dry treatment in all four quarters with a 60-day dry period. Pregnant cows with high SCCs or chronic SCC issues are evaluated along with production and occasionally are sold. Dry cows are in sand-bedded free stalls that are scraped once daily and bedded as needed. They have dirt exercise lots during nice weather. Feet are trimmed during late lactation. Dellar: Cows are dried off for 60 days using Spectramast DC in each quarter, followed by Orbeseal teat sealant. They are dipped with T-Hexx Dry at dry-off and a week before calving. They are vaccinated at dry-off, one to two weeks before calving and 60 days postcalving with J-5. We use sawdust bedding in our dry cow barn. The stalls are raked and cleaned daily. The alleys and waterers are cleaned daily, as well. Kleinhans: Dry off all quarters with Quartermaster. Orbeseal is used as a teat sealant. Vaccinated with J-5 and Salmonella vaccines. Sand stalls are bedded twice a month and cleaned daily. Alleys scraped three times a day. Hooves are trimmed at this time, and all dry cows are kept in a tunnel-ventilated building. Tohl: All cows are CMTed at dry-off (result recorded). Dry treat with a commercial dry cow tube (Quartermaster followed by Orbeseal). Cows are given Endovac Bovi. Dry cows are in a free stall barn with access to pasture. Stalls are bedded with kiln-dried shavings. Stalls are cleaned twice daily, and alleys are scraped once daily. VanPolen: After milkout, we strip and wipe each teat with an alcohol pad . . . one pad per teat. We infuse either Albadry or Tomorrow into each quarter. We rewipe each teat with another alcohol pad and then infuse with Orbeseal. We then apply a barrier postdip and red or pink leg bands on both rear legs. Then we vaccinate with Cattlemaster Gold. Dry cows are housed in a free stall barn with sand bedding that is refilled every 8 to 10 days. Manure is scraped from stalls twice a day, and alleys are scraped daily. The barn has a high ceiling with adjustable curtain sides for ventilation. Brooks: We treat affected quarter with Cefa-Lac two times, 12 hours apart, and withhold milk. If there is no response, cow is culled. Dellar: A culture is performed. Based on the result, I choose an antibiotic or not to treat. 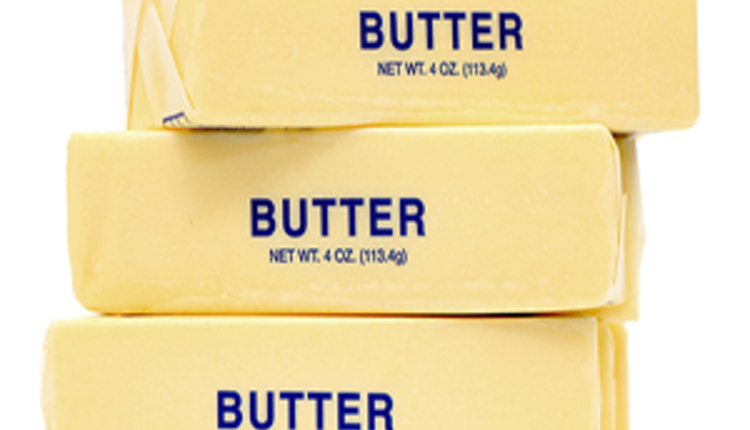 If treated, Spectramast LC, Hetacin, and Today are used most often. Kleinhans: Oxytocin intramuscular, and we treat with either Spectramast LC or Pirsue. Tohl: Pirsue, intramammary, four days. VanPolen: Strip quarter well, inject 1-1/2 cc oxytocin, milkout, poststrip, and apply barrier dip from separate dip cup. Brooks: Same as for mild cases, plus oxytocin. 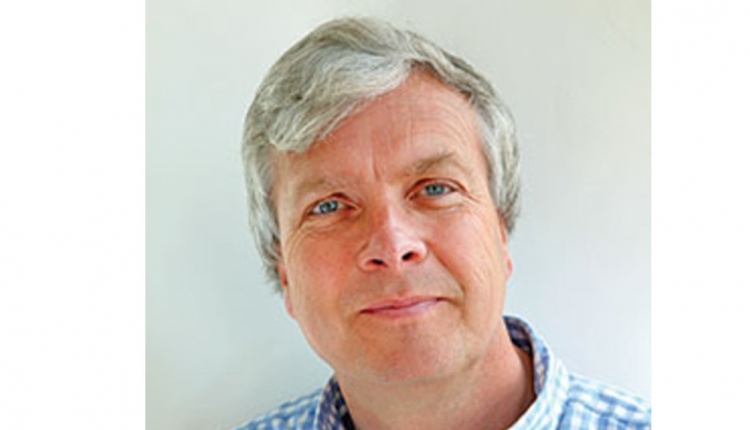 Dellar: Culture is performed, but cows are treated at first sight with Spectramast LC. oxytocin 2 cc at each milking. Banamine intravenously if fever is present. Kleinhans: Same as for mild cases. Tohl: Today, intramammary, Flunixin IV, Oxytocin intramuscular. VanPolen: Strip quarter well, inject 1-1/2 cc oxytocin. Milk cow out. Infuse quarter with Amoximast. Dip with barrier dip from separate dip cup. Liniment rub on swollen quarter. Apply red or pink leg bands to rear legs of cow. Repeat treatment for two to three days. Brooks: We just don't have any of these. Dellar: Cow is drenched, otherwise same as for moderate cases, and cow is separated. Kleinhans: Oxytocin IM and treat with either Spectramast LC or Pirsue. Also, IV oxytetracycline-dextrose bottle hypersaline with Banamine. Tohl: Hetacin K IMM. As needed, oxytocin IM, Flunixin, IV, hypertonic saline IV, and systemic antibiotics. VanPolen: Strip quarter. 1-1/2 cc oxytocin. Milkout. Treat quarter with Amoxi-Mast. Penicillin, intramuscular for four or five days. Drench with fluids. Leg bands are placed on cow. Vitamin B injections for two days. Brooks: Red duct tape on rear legs, written on daily parlor log, and verbal mention to herdsman, owner, or next milker. All treatments and health events are recorded on paper (Cardex files) and into PCDart. Dellar: Red ankle bands (Velcro style). We use calendars. Every milking time has a calendar, every treatment is written giving the date, what drug, and how many times it has been used. Records are kept on PCDart computer system and calendars. Kleinhans: Green leg band on both rear legs and marked with pink paint stick on back pins. Everything is written down on a chalkboard (visual and quick) and posted in parlor. Treatments are written in a notebook, dated . . . which quarter and how long treated. Tohl: Red leg bands, milk unit computer flashing "hold." Cow number, type of medication, date on board in parlor. Treatment book includes cow's number, amount of drug, how treated, number of times treated. Treatment book information also entered on individual cow computer record. VanPolen: Red or pink leg bands are placed on both rear legs of all treated cows, and a journal is kept in the parlor. We keep a journal of all treated cows listing dates of treatment, length of treatment, and drugs used. We keep these journals listing treatments for all future reference. Practices used by the five Platinum winners in the National Dairy Quality Awards competition featured here reveal some similarities. All five have parlor/free stall operations with the Tohls from Oregon using quite a bit of pasture. Four of the five bed with sand. Four of the five have both family members and employees who do some milking. The milking routine of three of the Platinum winners involves stripping some foremilk to check for mastitis followed by predipping. Two predip teats, then strip. Among the winners, 47 herds are handled in free stall/parlor operations. Herd sizes ranged from 15 cows up to 2,170. The average was 217 cows per farm. Milking herds are bedded with sand on 29 of the farms. Thirty-eight of the farms made use of Dairy Herd Information testing that included getting individual cow somatic cell counts. Nine of the 57 farms produce organic milk. A combination of family members and nonfarm employees do the milking on 36 of the farms. Family members only do the milking on 17 farms. Milkers wear gloves all of the time on 46 of the farms. Essentially all of the farms strip some milk from each quarter before milking to check for abnormal milk. Most of them, 34, predip teats, then strip. The others strip some milk, then they predip. Most farms, 41 of 57, culture milk from clinically infected cows to determine the pathogen involved. However, only 24 of the 57 run bulk tank cultures routinely. Among the 57 top farms, 38 had a fresh-cow monitoring program that included using California Mastitis Test or some other cell count monitor. Essentially all of the nonorganic farms used some form of antibacterial dry cow treatment. Thirty-five of the farms use an internal teat sealant at dry-off. Sixteen use some type of barrier teat dip when cows are dried off.